I have been spending quite a bit of time working in my sketchbook these days. I spent my Friday night sketching away amongst a bunch of talented people. We worked through the night on our different projects and I found myself craving a little bit of hands-on art making rather than my purely digital process. I did a pattern the 'good ol fashioned way' this time, where I inked each layer separately, then compiled them together in the computer and colored them. I'm really enjoying letting the inky brush strokes show on these and backed by a dark background you really see it. 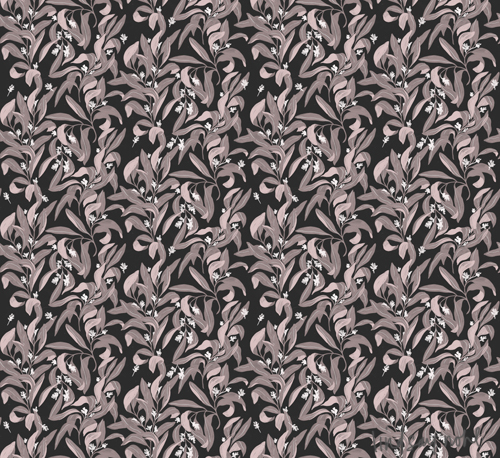 This pattern is inspired by the olive flower. 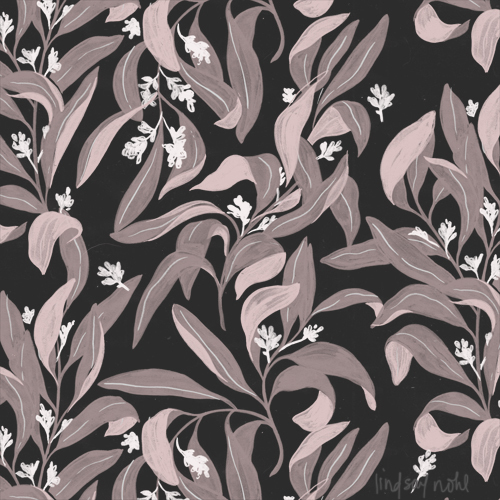 I really like the shape of the leaves more than anything, so I did something a little viney -- reminiscent of a wall paper pattern. School just ended this week. Another semester is over and I'm feeling a little sad from it all. It's funny -- I've felt the same way every time another semester goes by. From the time I got out of school to now, it feels the same. I miss all of those people that I got close to over the semester. I won't get to see some of them until the new year, and some of them I may never get to see again for a long while -- or ever. Waah, maybe it's the music I have on right now, or maybe it's because it's 3am and I'm finally posting this pattern before I head to bed, but whatever the case, I was just thinking about those guys. I had an amazing last day of class with everyone. I suppose nothing can last forever. I'll just be thankful I got to share the semester with everyone. It was a blast. 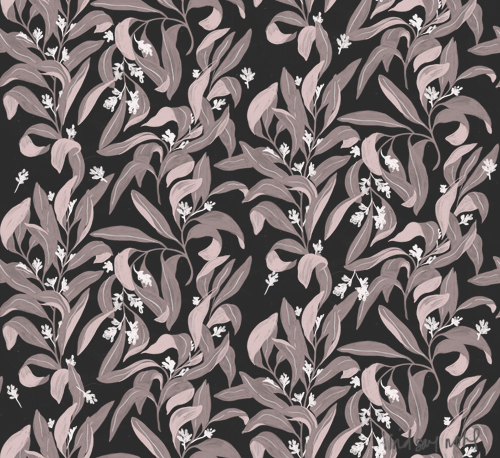 This pattern is absolutely lovely. It's also very wintery. Feels very much like MN right now. I am still trying to figure out how to marry both digital and traditional, as I feel overwhelmed when it's all trad work (funny, coming from a girl trained in fine arts), but get bored out of my mind with just a digital process. Totally understand your feelings! Thank you so much! I totally know what you mean - the grey/purples are always on my mind, but in this season specifically!! I really love this one! I know what you mean about that "end of semester feeling". I always loved being in school--all the awesome people and all the learning--so good! The end is definitely bittersweet. I'm curious--when you ink each layer separately, are you using different sheets of paper and a light pad? Or other means? I know- right??? I love school for so many reasons and the community aspect of creating with a bunch of people is one of the things I miss the most! I do us separate sheets of paper - I should scan those. Maybe for next week's I'll show you and put those in the post! It's a fun process and I work on marker paper for it. I forget the name of it, but when I get a chance I"ll look it up! I use a light table, too, for doing all of the layers!